Everything’s online nowadays, meaning people can easily connect via social media and phone conferences. It’s easy to think that real-life conferences are a thing of the past, but actually, it’s the exact opposite. Conferences are important for small businesses to attend more than ever now. Basically, there’s no replacement for meeting people in-person. To network – While you can network online, there’s nothing like networking face-to-face. Face-to-face networking allows you to have a long conversation with someone, get to know someone on a more personal level and get to know those that are presenting. You may forget an email between a business associate, but you’ll never forget a face. To break up your routine – Stepping outside the box allows you to think outside the box. By breaking the monotony of your day to day routine, you’re helping get your creative juices flowing. You may come up with a new business strategy, think of a way to better your product or connect with someone to market with. Attending a live conference is one of the best ways you can break up your routine. To learn from others – Even if you consider yourself an expert in your field, you can always learn more. You may pick up something as big as a new strategy for your business plan or something as small as a new marketing technique. Either way, you’re guaranteed to learn something that will help your business by attending a face-to-face conference. To meet your competitors – By attending a small business conference in your field, you’ll meet business owners just like yourself, i.e. your competitors. This is your chance to mingle with those that are more successful then you. You can ask questions and gain insight in order to improve your business. It’s also your chance to share your knowledge with businesses either just starting out or not as successful as yourself. You can present yourself as an expert in your field. To relax – That’s right, attending a business conference can be a great way to relax while still working and improving your small business. It’s the best of both worlds. Come a day or two early or stay an extra day to explore the city the conference is in. Don’t feel obligated to attend every conference, either. If you wish to sleep in, sleep in. If you want to catch up with an old friend who lives in that town, go! Think of it as a mini-vacation where you get to have fun while still growing your business. If you’re worried about travel expenses, most small businesses can write them off come tax season. You should be able to write off food and hotel expenses, as well. Make sure to check discount travel sites for deals on airfare and consider splitting the cost of a hotel room if you know someone else that’s attending. 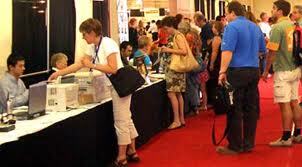 Small business conferences take place nationwide throughout the year. Find one in your field, book your flight and go. Make the most of the experience by having fun, being social and proudly sharing what you’ve accomplished with others. More than likely, you’ll want to attend conferences on a yearly or semi-yearly basis. 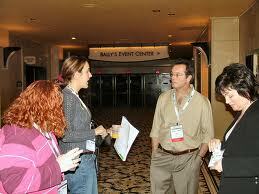 Like was stated earlier, nothing replaces face-to-face interaction that a business conference provides. About the Author: Sarah Brooks is a freelance writer living in Glendale, AZ with her husband and two daughters. She writes on cheap Vegas hotels, travel and small businesses. This is quite untrue in case of organizing events and meetings. It doesnÂt matter how well you have organized an event if you are unable to effectively market it. Lots of organizations and groups fall short in this regard only because they send out simple announcements listing the time, date, speaker, and location of an event. You, as an event organizer, have to realize there is a lot of competition out there, and you need to convince prospective attendees that you are worth their money and time. If the event has only a single speaker, then their program title can be used as the headline, if it satisfies the criteria given above. Multi-speaker events will require you to present the overall benefits for the reader in the headline. Be sure to make this information easy to locate. In fact, mention it twice at least on the web page or brochure. A map with parking information and driving directions is a nice addition too. If applicable, you should also mention the transportation and hotel information. Other than these, mentioning savings such as discounted rates on group bookings can also help your cause. Give a general idea of the things taking place in the event. You should include the schedule, such as networking time, meals, or other important details for multi-day or all day long meetings. This is the essence of the marketing message. This topic explains to the prospective attendees why they should invest their valuable resources in coming to your event. You have to be specific while promising results. The biographical information about speakers at the event establishes their credibility. Potential attendees probably wonÂt care about the bio of the speaker anyway, but not including this section may lead them to doubt the eventÂs credibility. Be sure to make the registration process painless. If the registration form is too confusing or very exhaustive, chances are potential attendees will simply reject the event due to the formalities involved in filling the registration alone. The registration instructions should be easy to follow, clear, and simple. Apart from the speakers, include other highlights of the event. This can include local tours, autograph session, trade show, banquet, concert or show, live demo, organized activities, and so forth. Testimonials are other powerful marketing elements that are generally overlooked by event organizers. You should use two different testimonial types: one from speakers, and other from past attendees. These should preferably be result oriented, and the more, the merrier. Finally, a call to action should conclude the whole sales presentation. Without it, prospective attendees probably wonÂt take any action apart from reading the whole presentation that you so painstakingly produced. Be clear at the end with lines such as ÂRegister from this linkÂ; ÂFill form given belowÂ; ÂNow!Â TodayÂ; or ÂFax to this numberÂ. Author’s Bio: Jessica Davis is a Content Strategy Specialist with Godot Media – a leading content marketing firm. She has years of experience working closely with online businesses, helping them refine their marketing strategy through optimum use of content. Her other interests besides online content strategy, internet marketing and search engine optimization are, technology, sports and fashion. 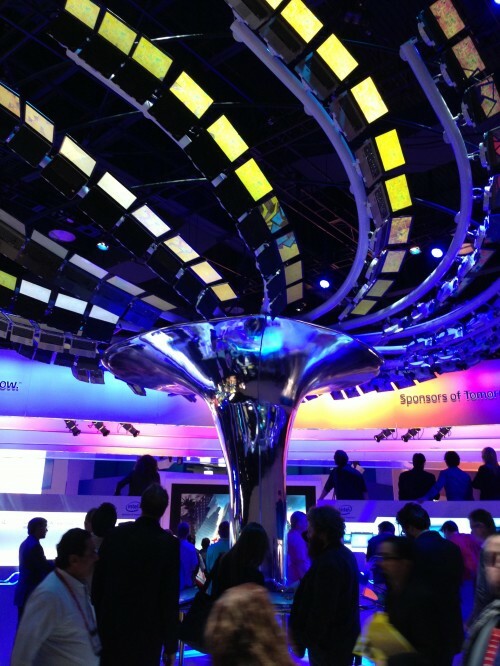 Walking the exhibit hall at the Consumer Electronics Show in Las Vegas is an awe-inspiring experience. The exhibits are huge, the keynotes are standing room only, and conference sessions are elbow to elbow. From what I’ve heard, SXSW is heading in the same direction…possibly too big for its own good. That’s why I like to focus on the smaller, more intimate conferences, like SOBCon (back in 2014), Social Slam, or the upstart ConvergeSouth. There’s still plenty of room for learning new stuff, meeting new people, and forming quality relationships. There’s less swag, and more value for your money. You can focus on a conference that dives deeply into your niche. Rather than a huge, generic marketing conference, try one that focuses on content marketing. Have better conversations. When you can actually hear yourself talk, you can have those great hallway discussions that often turn into long-term relationships. With fewer people milling around, you have a better chance of having more than a quick chat. Get access. Some of the smaller conferences pull in heavy hitter speakers, and you can have much easier access to meet them. Especially if you spend the little bit extra for a VIP pass. Enjoy the adventure factor. Sometimes things are just more loose at a smaller conference. You might find yourself in a dive bar at the after-after-after party building memories with people you only knew online. Not that that ever happened. I’m not allowed to say. Anticipate the “let’s put on a show” factor. Smaller conferences often have a hardy band of local volunteers who are shouldering the burden of hosting. It’s a fantastic opportunity to offer your help with the little things. If a speaker flakes out, you could be there when you’re needed to jump in (I’ve seen that happen). If the audio-visual hookups are wonky, you can jump up and troubleshoot. Earn the eternal gratitude of the conference team, and make some friends. Spend less money. The newer, smaller conferences are cheaper, and sometimes even the peripheral expenses are lower since they are held in smaller cities. A hotel room in Greensboro, NC is much more affordable than one in New York City. And do I need to mention food costs? At a small conference in Portland, I had the most amazing grilled cheese sandwich for lunch from a food truck. Cheap and mind-blowingly delicious. Are you ready to pack your bags? What are your favorite smaller conferences? Everybody wins when companies have the opportunity to interact directly with buyers, which is exactly why trade shows are so beneficial. In terms of a buying and selling market, nowhere are business connection opportunities and company publicity as prevalent as with large, industry-wide trade shows. So, in terms of benefits, why should your business have a presence at trade shows in todayÂs market? Trade shows are a testing ground for new products that result in instant consumer feedback. What this means for your business is, if youÂre still trying to get a product line off the ground, trade shows offer a platform to put that product on a small-scale market, see how it performs, and receive reviews in real-time. Whether a seller or a buyer, trade shows offer a unique way for businesses to gain access to a market they otherwise wouldnÂt have the ability to tap. In other words, vendors with limited market access due to distance or company size are able to use trade shows as a one-stop shop for getting their voices heard and products seen. Small businesses simply donÂt turn into large companies without large-scale publicity. And, although trade shows arenÂt necessarily large-scale events, theyÂre a launching point for businesses both large and small. So, for those companies without the means to market, advertise, and publicize on a national scale, trade shows are essentially a marketing shortcut. As long as the products are worthy of attention, trade shows are a great way to create industry-wide buzz. Because trade shows are a stomping ground for like-minded businesses, simply attending an industry trade show will help your business gain essential knowledge in terms of product trends, sales techniques, and the future of the industry. Your business should consider trade shows as a marketing crash course and go into the event with an open mind and willingness to learn. Even if you leave the trade show without selling a single product, the market and industry knowledge gathered is worth its weight in gold. With trade shows, the time-consuming process of setting individual appointments is almost non-existent. Because trade shows are a one-stop shop, your business has the ability to meet with potential buyers on a continuous basis throughout the length of the event without the inconvenience of scheduling times and locations. When multiple buyers and sellers interact continuously from one location, it saves both parties a lot of money. And, as opposed to approaching buyers one-on-one, your business can market by group, which is a popular trade show mentality. Not only that, but the main reason buyers attend trade shows in the first place is to buy, so theyÂre already in the right mindset when they arrive. So, when your business decides to make an appearance at trade shows, itÂs beneficial for everyone involved. As a business owner, what have your experiences at trade shows been like? About the Author: Adam Groff is a freelance writer and creator of content. He writes on a variety of topics including personal health, how to be first on Google, and business. So I am going to ask you all to help with this little project. On Sunday the Lovely Bride TM and I went to Boston for a trade show and I stopped by the Levenger store to pick up some supplies for this “secret project“. I am looking forward to seeing what the attendees put together. If you have any ideas on how to make this better, please let me know (contact form). I went down to Boston on Sunday to accompany the Lovely Bride TM to the NE Food Expo and I have to say that it was thoroughly entertaining. I have not been to a trade show like this in a few years and there were a few observations that I found interesting. First, each attendee had a name badge with a 2-dimensional barcode on it. The vendors in their booths had supermarket-style scanners that could read the bar-code and print out a contact form. This form was pre-populated with the attendee’s contact information and then the vendor could write in any notes or additional information. This is an expensive but very useful improvement to the “old way” of gathering contact information via a sign-in sheet or simply collecting a business card. I know that this is not exactly a “new” technology but it was the first time that I had seen it. The biggest impact on my own attendance at this show was that I felt much more comfortable because the vendors that I spoke with were less concerned about getting me to fill out their form. “Can I scan you”, was all it took, much less intrusive. Of course, this is a standard expo/trade show gimmick: get some pretty girls to show off your products and get more attention for your booth. Since I was with the Lovely Bride TM I did not even bother to attempt to get any action shots of the young lovelies, she would have called “BS” on my claims of “research” (this is a stock photo). What struck me about these spokesmodels was that only about half of them seemed to speak English as a first language, I suppose that it is an indication of the state of the economy. About 25% were actual sales reps and were quite knowledgeable about the products or services, the rest simply played back a carefully memorized spiel. This leads me to the third observation – that there was virtually no Social Media component to this show. Not one vendor asked us to sign up for an e-mail newsletter, mentioned a Twittername, or told us about their blog. Of course it is New England and these are hospitality vendors – not exactly on the cutting edge in media technology. It seems that the focus was much more on “going Green” than on creating a community. Not that there is anything wrong with that. With the badge-scanning technology and ability to register for the expo fully online, I expected a little more interaction from this trade show. Some of the most advanced tech that I saw offered were for surveillance of patrons and employees, rather than for communicating with customers and clients. I am curious as to how long it will take for Social Media tools and techniques to filter down to the rest of the marketspaces that currently do not take advantage of them. What ideas would you present to a business that has no Social Media program?